Last night my sisters and I threw a bridal shower for our future sister-in-law. We were inspired by these pictures from their engagement photos and decided to go with a story book theme. I thought it was the perfect theme for a party celebrating the beginning of a new chapter in their lives. We wanted to have a more intimate setting for our 35 guests, so we decided to have sit down dinner. It was a little more work but was so worth it. We ate family style with all the food on the tables making it as easy as a buffet. We served quiche, spinach salad, fruit and rosemary rolls. We have a library of old books that came with our house. It was so fun to use them with our theme as decorations. I enjoyed this shower more than any other. Instead of running around making sure the buffet was full and everything was taken care of, I was able to sit down and enjoy the company. I wish I had taken a few pictures of everyone sitting down and eating. We had the exact setting we were hoping for. The wedding is this weekend. I'm sure I'll be back to share lots of highlights. This theme is super gorgeous. This is by far my favorite shower idea-- ever! Makes me want to host a girls' lunch just to use it! What a fabulous fete. Best wishes for a fairy tale weekend. Oh what great pictures of the happy couple! By far the best shower Ive ever been to!! You guys did such a fab job!! Sounds like a glorious time! Beautiful pictures and theme! LOVE old books! Wow, what a beautiful couple! And the shower looks like it was equally lovely. Well done! Your shower looks just devine! So so pretty! I love the color and the books and the simplicity...although I'm sure it wasn't simple to put together. What a super cute couple too! So nice to hear that you were actually able to enjoy the shower too...sometimes we forget about that part when we are hosting something! Ooooo!!! That tablescape is so pretty! Great job! Cute engagement photos! The shower looks amazing! You have a lucky sister-in-law! a bookish bridal shower! how unique and a creative is that! books with their lovely patina make such amazing adornments (not to mention useful ones). i love it. great idea! that is absolutely wonderful. low key and personal, that is the best. i am sure the future bride loved it! Oh my, how ingenious! Please come link up to Fabulous Friday when you can! This is most certainly fab. Just a heads up that this project will be featured on my Lazy Sunday Post! Make sure and stop by to check it out! What a beautiful shower and what a creative idea! I love the idea of using books and I think the way you displayed them was so pretty. So creative and original! That looks like the most wonderful shower ever! I bet the bride to be felt very loved and welcomed to the family! 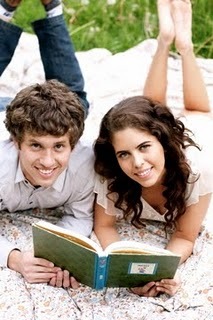 Those are the cutest engagement photos ever!! What a beautiful shower! I love your green plates! Those are the cutest picture of the happy couple and the party is fabulous!! Love this! What a beautiful table setting and a beautiful shower. You have some talent there to create such a beautiful setting. Thank you for letting me visit. What a great idea. I was thinking this was a baby shower. Surprise! Love it for a bridal shower too. PS--Popped over from Tator tots. Love to see you at Dreaming! What a great idea!! It looks beautiful! Wonderful! I always assume that sit down dinner showers are just too much money, work, etc. but this makes it seem so do-able and fantastic! Thanks.